In the 2013 civic election, 79 candidates ran for mayor and city council, 17 of which were women. The election resulted in one woman getting elected out of a council of 13. Though women represent 51% of the city's population, they represented only 22% of candidates, and resulted in 8% of council seats. With results like this, it's little surprise that groups like Equal Voice are calling for improvements to our system, including encouraging a larger diversity of candidates and promoting a more balanced and representative city government. Taking a deeper look at these results shows some interesting trends though. For instance, in 5 wards in 2013, there were no women running at all, and half of all female candidates were clustered in races in two highly contested wards. 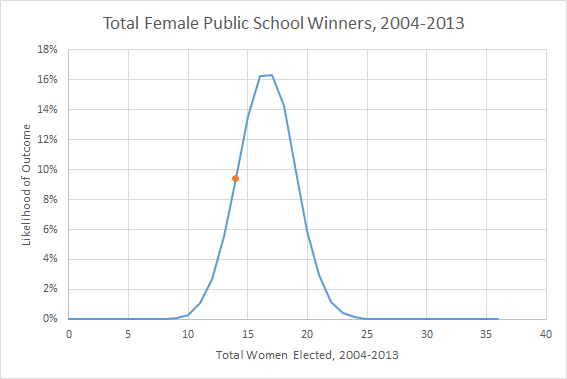 This suggests that, while 22% of all candidates were female, the distribution of female candidates may have already been predisposed to a lower number of female winners in the end. Let's take a look. As previously mentioned, there was absolutely no chance of there being anywhere from 9-13 women on council, as 5 races were contested solely by men. Based on the uneven distribution of candidates in the remaining races, there was an expected 2.01 female councillors last year, or 15% of council. 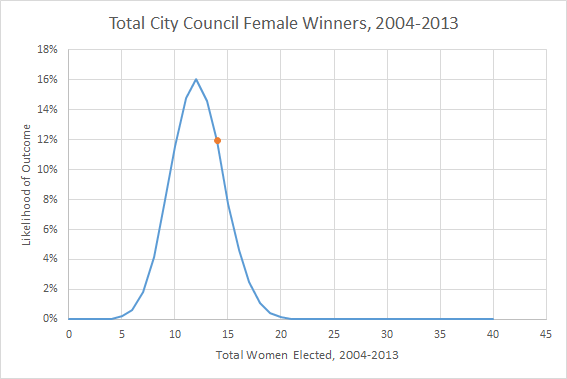 So while the number of women on council was still less than expected, it was closer than what we might have expected based on the total number of female candidates. Instead of being 14% lower than what we might expect from candidate distribution, we were 8% lower. 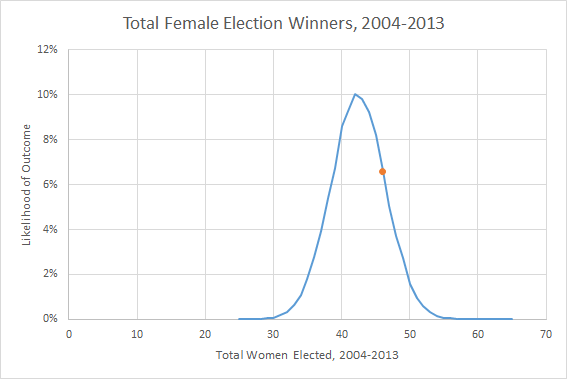 So does this mean that female candidates are 8% less likely to get elected than male candidates? That's really hard to say, and it turns out we don't have enough data yet. One way we can check is by looking at the p-value of our outcome - what's the chance that we could have gotten something as bad as the result we did, assuming our null hypothesis (that women are as likely to get elected as men) is true? In this case, the p-value is 0.37. 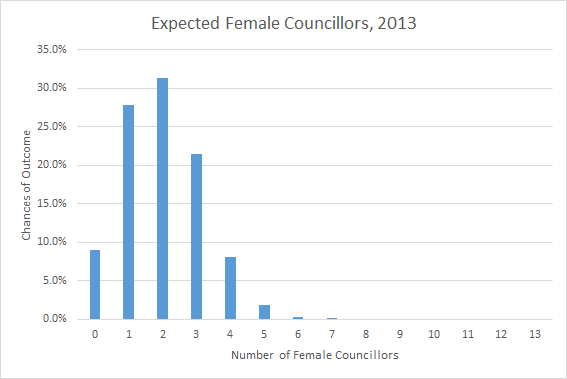 Essentially, our data set is small enough that any result between 0-4 female councillors wouldn't have been all that much of a surprise (and in fact, 6-7 would have been an indication of an opposite effect). So let's not worry about significance yet, and instead look at more elections! 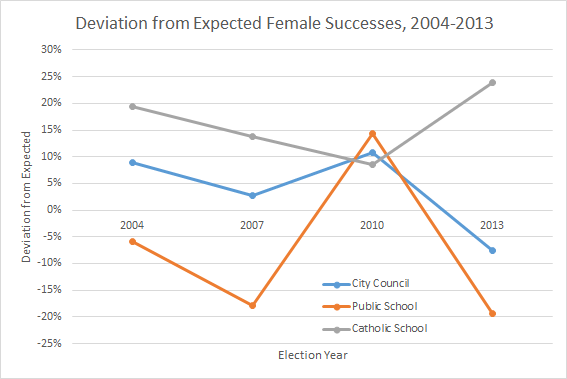 City Council results over the last 4 elections haven't shown more than a 10% deviation one way or another. More importantly, the p-values for each election have been totally reasonable. 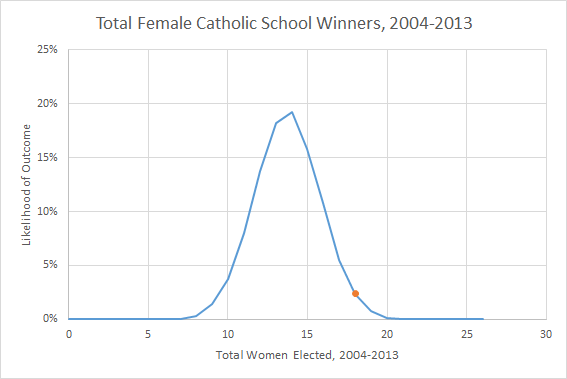 Catholic School Board elections haven't shown an anti-woman bias in this data set. *: Here it's worth mentioning that before 2010, the Catholic election system was really weird and had a wildcard winner from whoever had the most votes but wasn't elected in their ward. This was particularly silly seeing as not all wards were the same size, so I've ignored the wildcard seat and victor for the purposes of this analysis. The fortunate summary of all of this is that there's no evidence that any system is rigged against female candidates. That being said, the proportion of women elected to civic office in the last years is just under a third of total offices filled, which isn't even remotely balanced. The best way to get a more representative council is to have more under-represented demographics put forward their candidacy, so if you know anyone who might be interested or qualified (of whichever underrepresented group you choose), I strongly encourage you to encourage them to run.